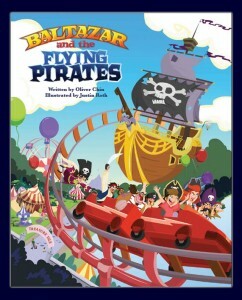 Baltazar and the Flying Pirates is more or less the tale I just described, brought to life in colorful, friendly artwork. The pirates are a misfit crew indeed, with some members you may recognize (Anne Bonney, Long John Silver) and still more that are new to this story (Flynn, Captain Redlocks, Big Queeq, etc.) Each is a character is unique and memorable as their names, to say nothing of the story’s “every boy” protagonist, with the truly unusual name of Baltazar. It’s an amusing story that should be well enjoyed by any younger buccaneers, along with their parents, older siblings, or captains. This entry was posted in Books and tagged children by Bilgemunky. Bookmark the permalink. ZOMG! Pirates AND rollercosters? No wonder you took the time to read it. Zoom Zoom Zoom!